Just yesterday a gal I skate with most days was asking me how my new skates were doing. She had noticed I had begun doing a few small jumps and attempting some spins lately and she wondered how my new boots were treating me. I told her I really love my skates, but I am still not one-with-my-skates ... in other words they still feel like they are attachment to my feet. Once a good pair of skates is properly broken in, you don't notice they are there unless they get too loose or you lace them incorrectly. I further rambled on to tell her how amazing it was that I was so comfortable in them, that I had no blisters or pain of any kind, except that my left ankle was a little swollen from skating without enough support the first few days. I had laced the boot so loose my ankle had to do all the work itself. That was yesterday. Today I laced up and immediately felt this sore, burning sensation on my left ankle. I returned to the bench to re lace and/or move the tongue into proper position and this is what I found. 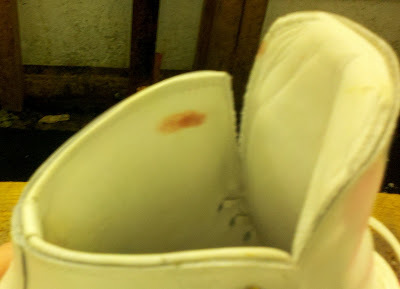 My beautiful new boots are blood stained! I believe the edge of the tongue is rubbing my ankle. I tried skating afterwards with a glove inside my boot. It hurt and was getting worse so I decided to cut my practice short today. Next stop - the pharmacy for some bandaids and wraps for my ankle. Today is Monday, or what I like to affectionately call, "What the hell I am doing this for?" day. I don't understand it. I skated 4 days last week and I also skied 3 days last week. I should feel pumped and raring to go, but instead I felt wobbly and weak - and cold. My rink is really cold. How cold? I don't know, but my fingers will go numb if I don't keep skating and pumping blood into my fingers. My medical chart actually says I have Raynaud's Disease, but I don't think I do. Perfect disease for an ice skater! I warmed up today with a few laps, then did my entire run through of the Pre Bronze Moves In The Field and then the Pre Bronze Free Skate. I specifically wanted to try the jumps while I was less than warmed up to see the result. Result: I nearly fell. I will have to wake up really early the morning of my test and be sure I am fully stretched and warm from off ice warm ups before I go out there. I got a few suggestions from my skating friends on Skatingforums.com Alas.. having a suggestion only works if you do it! Salchow and a few Spirals. Next week she wants to see what I plan to wear. I have prematurely acquired a collection of dresses in my closet, but they all seem too formal or have too much "bling" for a Pre Bronze test. On the other hand, who knows how long my AARP skating "career" will last. Maybe I should wear a little bling while I have the chance. 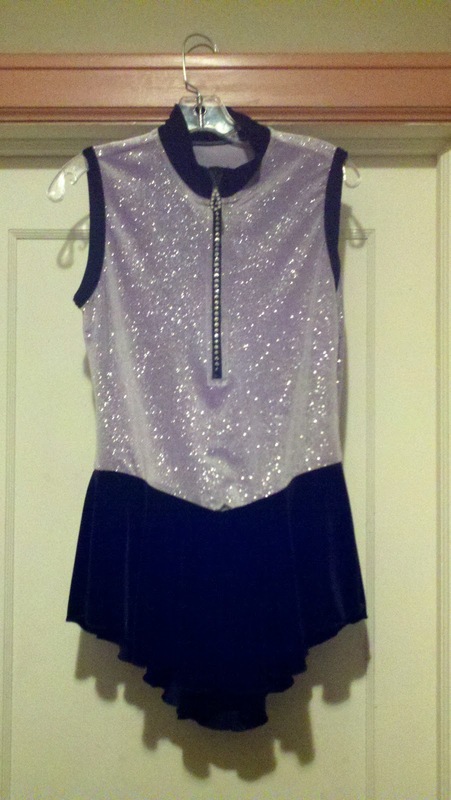 I think I will go with the lavender sleeveless dress and put a black sweater over it for the MIF with white gloves. 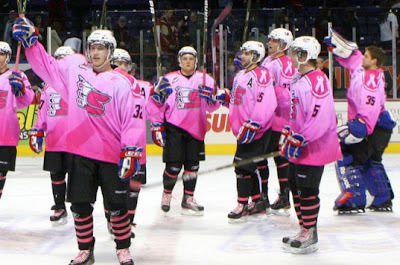 No skating for me today, but I am headed to PINK ICE night at the Spokane Chiefs Hockey game vs Tri-City. They will wear pink jerseys and donate a portion of all the proceeds from each ticket to raise money for breast cancer awareness and a cure. Chiefs lost. Didn't take any photos of the game, but I bought this tee shirt. 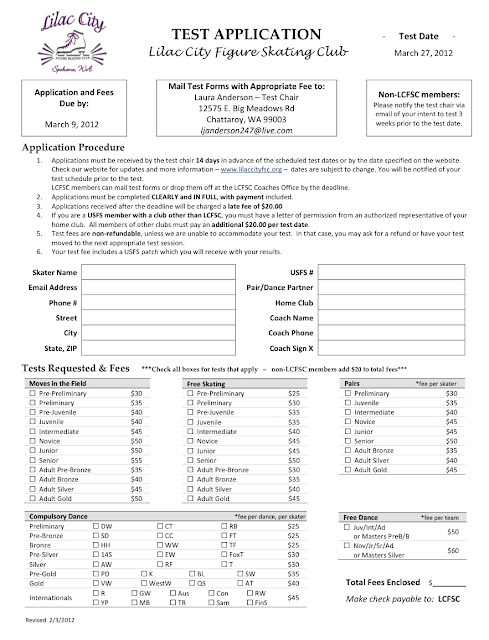 Upcoming Tests and FormsNote: Testing dates are subject to change, please check this page for date changes and updated forms as they become available. My test date just got moved from March 30 to March 27. No big deal right? Wrong. I'll be on a cruise ship until March 26. Flying home that evening. Late. Jet Lag. I will have to get up early the next morning and attempt this test after 11 days off the ice, sipping drinks with umbrellas and eating gourmet meals 3 X day for 10 days. This should be interesting. Due to the grace of my right elbow in the kitchen this morning, I was late for practice. 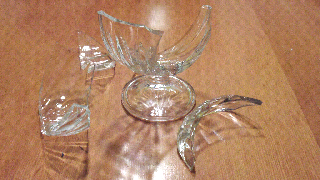 I somehow knocked a glass candy dish off my counter top and flung it onto the floor, shattering it into a million pieces. 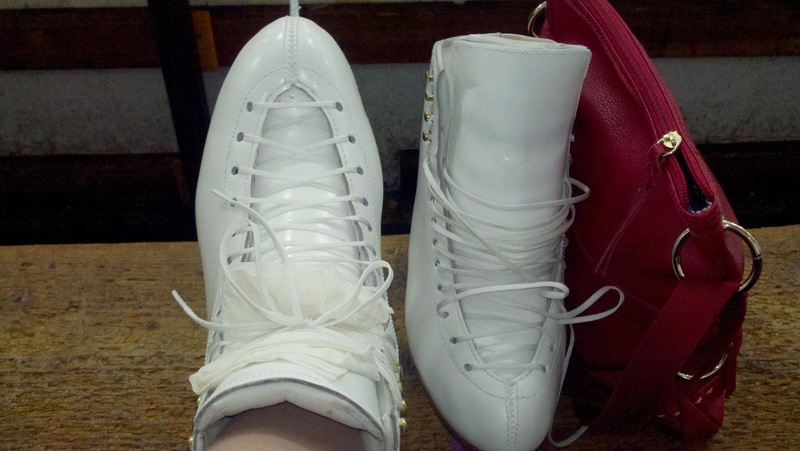 My skates are feeling more and more like my own as they break in. I am trying to stop and re-lace 3-4 times per session for now to keep the laces spread out over the tongue. Two foot spins I really hate doing these. Once the Pre-Bronze test is over so will the two foot spins. It's a requirement for the Pre Bronze Test. One foot scratch spins I'm getting less dizzy and more revolutions. I had a few more screws added to my mounting this weekend. We are pretty sure they are set correctly for the permanent mount. The two top holes are left empty until the plate conforms to the sole of the boot. Not sure if you can see from the photo that they do not touch yet. I had a lesson today at the end of the public session. Since today was a holiday the kids were out of school. The rink was pretty crowded and the ice got chewed up pretty fast. There was even a lady skating out there PUSHING A STROLLER with a toddler in it. Don't they have rules about things like that? Another pair of young boys were playing fetch with a skate guard, tossing it down the ice to each other. So I bobbed and weaved my way around the rink trying to get whatever practice and exercise I could amid the chaos. Jumps: Two different jumps, either one-half or one full revolution I am planning a Waltz Jump and a Salchow or a Toe Loop. The biggest thing I learned today was that putting all these unremarkable elements together with not much time in between is much more tiring than I expected. I really need to work on my stamina. Hence forth I will practice them all in sequence. 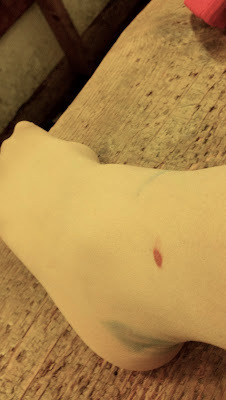 Today I used paper napkins under my laces and over my tongue to ward off lace bite and to keep my laces disbursed over the ankle evenly. It worked out pretty good. When I was done skating I had something to blow my nose into! Still felt a little wiggly today and discovered at the end of my session that my temporary mount is loose. Hmmmm. Maybe I should not have attempted the little jumps quite yet. 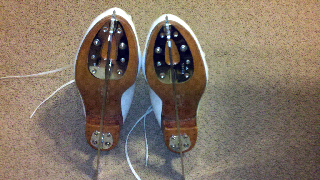 Tomorrow I will tighten them up before I skate and take it easy. Today I braved wearing a skirt and leggings. I was really lucky as there weren't many people at the rink and I found myself alone for the last 20 minutes. I hope I didn't scare them off! I have been capturing my videos on my DroidX phone which is HD. Here's one from today. 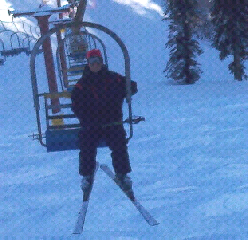 I was practicing the jumps for my upcoming test. Everything needs a lot of work. I need to get used to my skates before I can launch any higher or spin any faster. Right now I am just grateful not to be in traction! I still get dizzy when I spin, but I can see my hip is too high which is throwing me off center. My jumps all lack confidence, but overall I am pretty happy after just 1 1/2 months of being back on the ice. I gave my ankle a rest yesterday. Instead of skating for 90 minutes I went skiing for 3 1/2 hours! My legs were tired and shaky today. Day 2 on new skates. 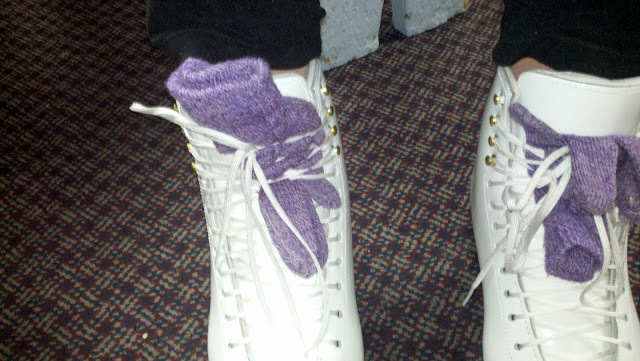 I laced up and skated for an hour before my lesson. While doing back crossovers I somehow managed to tangle up my blades and I went down like a building being demolished by dynamite. 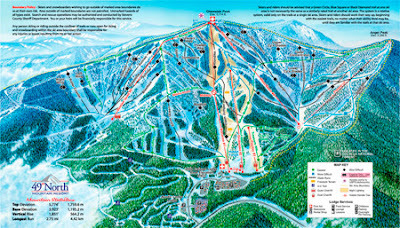 I came to rest (after sliding a ways) on my side with snow up and down my entire right leg and right arm. I guess that's why my shoulder hurt so bad! There is nothing fun about falling when you least expect it. There is nothing fun about falling anytime, but in skating falls are inevitable as you learn new elements, jumps and spins. The accidental klutzy falls seem to hurt much worse. My coach Berkley came out for my lesson at 12:30 and was anxious to see my new boots and blades. 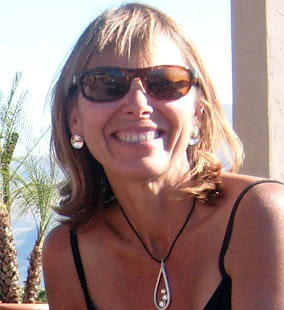 She recently got herself a new pair from the same manufacturer, Harlick. She watched me lace up my boots and discovered that I had already put a healthy crease in the tongue of my boots from the manner I was lacing up. I guess I had a tendency to lay the laces from both the 1st and 2nd hooks into the same part of the tongue, one on top of the other instead of separating them and giving them space in between. She recommended that I always try to give space in between and cross them a bit less uniform. She warned me I might get "lace bite". It sounds terrible. I already have an inflamed tendon in my left ankle. I thought it was from my boots being too loose and my ankles compensating to keep me balanced. you can stick gloves between the laces and the tongue for the final hook lacing to help aid in spreading the laces over the area and preventing a permanent crease in my tongue in one place. Last week I found out that the next TEST DATE is March 30, 2012. I didn't think I should try to do 2 tests on one day. I could probably pass the Bronze Moves in the Field, but I would have to apply to test on the Bronze Moves on a contingency basis. If I did not pass the Pre Bronze for some reason, I would lose the opportunity to test Bronze and lose the $40 test fee. Better to go out there confident and pass my first two tests at the same level. After all.... I did totally chicken out (see paragraph 7) the last time I tried to free skate a test 41 years ago! I hope to rectify that next time. Today my coach wanted to see if I could do the elements required in the free skate. 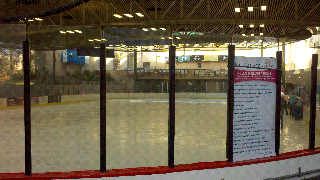 The purpose of this test is to encourage beginning adult skaters to learn the fundamentals of free skating. No great deal of technical ability, carriage or flow is expected. The candidate must show knowledge of the elements, fairly good edges and some evidence of good form. The following technical elements are to be skated individually, without music. Judging panel required: One or three bronze or higher rank singles/pairs judges. My lesson is only 15 minutes, so she wasted no time. As soon as my skates were laced up with Lilac gloves under the laces, we took to the ice and she said, "let's work on jumps". 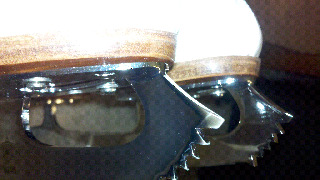 This surprised the heck out of me because my blades are only temporarily mounted and I have only skated on them twice. I think she figured that the level of my jumping was not going to knock the blades off. She was probably right! WALTZ JUMP - The easiest jump, which takes off from the forward outside edge and is landed on the back outside edge of the opposite foot. A Waltz jump consists of .5 revolution. If you add a revolution, for 1.5 it becomes a single Axel jump. It is easily recognizable as it is the only jump that takes off from a forward position. SALCHOW - Another edge jump taken off from the back inside edge of one foot and landed on the back outside edge of the opposite foot. Created by Ulrich Salchow. TOE LOOP - A toe-pick-assisted jump that takes off and lands on the same back outside edge. TWO FOOT SPIN - The basic first spin you learn. Entering from a stand still or from a controlled forward outside edge, the spin begins and remains on two feet. Gradual acceleration begins by drawing the arms close to the body. The spin exits into a backward outside edge. SCRATCH SPIN - Also known as an upright spin. After entering from a controlled forward outside edge, the spin begins on a back inside edge. Gradual acceleration begins by moving and placing the free foot toward the top of the skating knee and drawing the arms close to the body. The spin exits into a backward outside edge. Normally when I practice I put my "notes to self" in red next to the description of what I am attempting, but today I was just happy to get through it all without falling on my head! So today it's official. 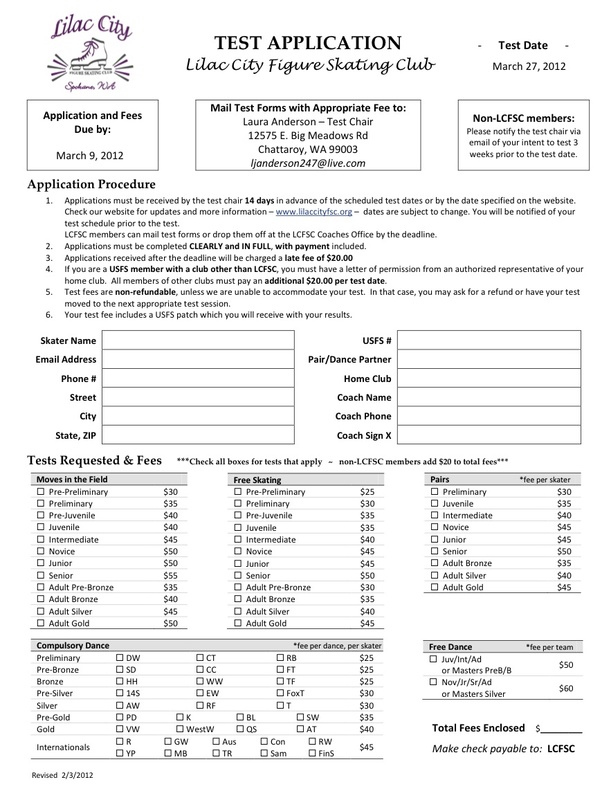 I filled out my test application and paid my fees. Finally home from the Windy City. First thing on my list of "to do" after saying hello to my Beagle Buddy was to try on my new boots. I can't get over how wide and large my new boots look. Obviously my feet needed a lot more room than my old boots provided. Still bumpy. Still cold. Still windy. Less crowded. 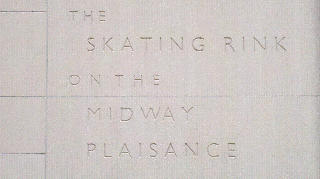 This is etched on the building of the ice rink. Here's an on ice tour of the rink. Arrived in Chicago yesterday on the train from Spokane after 37 hours of chugging along the tracks. The ride out was relaxing and fun, but after a day and a half I was aching for some exercise. We're here in Chicago for a few days visiting family who live in Hyde Park and work at the University of Chicago. Walking to work. What a concept! Chicago Parks and Rec Department has 10 outdoor winter rinks that are open to the public daily from 12:00 noon to 7:00 pm (some hours vary). Skating is FREE if you have your own skates and they scrape the ice every 3 hours or so. The nearest ice to our location in Hyde Park is Midway Plaisance Park, about a 20 minute walk from where we are staying. It's very picturesque with the University surrounding the Midway Plaisance Park. The ice felt soft to me. It's also not a clean scrape. There were a lot of lumps and bumps on the ice which is not conducive to holding an edge, especially for me. I am still trying to get my skating legs back under me on perfectly clean ice. It's about 30 degrees out today. Not much wind, but while I was skating the "windy city" breezes that come off Lake Michigan came up. It was so unusual skating against the wind. The outdoor rink in Spokane is covered and protected from the wind. I skated for about an hour, but did not accomplish much in the way of practicing. Today there was a field trip of young children there who did not know the counter-clockwise rules of the rink. There was no session "ref" on the ice. Kids were everywhere. I didn't bring my own camera today, so I borrowed this from the internet. Tomorrow I may try again if it's not snowing too hard. P.S. My new boots and blades arrived on Friday afternoon just before we left. I have not tried them on or anything yet. They look enormously wide (as they told me they would) and very stiff. I am so nervous about putting them on for the first time. I'll post a whole chapter on that when I get home. Look what came today. I didn't have a chance to do much more than look at them before we left town for Chicago. Phil from Harlick was right. I am shocked at how WIDE they look in comparison to my old boots. The last time I owned a pair of Harlick's my feet were 18 years old, not 52. Wow are these really for me? 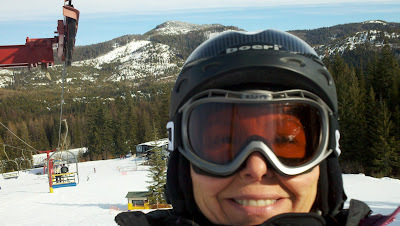 Took the day off to go skiing with my husband. I got on the chair too fast and we had to ride up separately! Practice today was on a quiet public session. I worked on my Adult Bronze Moves In The Field. This is the description from USFSA. The skater will perform four alternating forward crossovers separated by strong forward inside edge transitions. The end pattern consists of two forward crossovers followed by a LFO open stroke; then a RFI open mohawk followed by one or two backward crossovers. All end pattern steps should be performed with an even cadence except the LFO open stroke, which should be held for two counts. The second side of the pattern resumes with four backward crossovers separated by two-foot transitions, also known as a power push. Skaters should take care to perform the transitions on two solid inside edges. The second end pattern consists of three to five backward crossovers. Introductory steps are optional. 3. Alternating backward crossovers to backward outside edges I forgot to do these. The skater will perform alternating forward inside mohawks, skated in consecutive half circles. Each series consists of a five-step sequence. The skater will skate one length of the ice with four or five lobes. Introductory steps are optional. As you will see in my first video I took a graceful fall on the second element. I completely forgot to skate the 3rd element. And that's a wrap for this week. 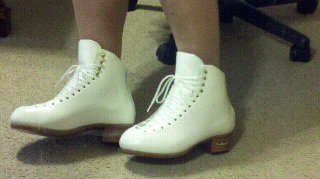 Tomorrow we jump on a train to visit relatives in Chicago, but I am bringing my skates along. 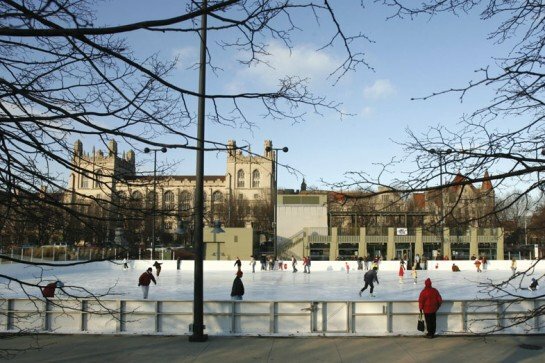 There is supposed to be a big outdoor rink near the University of Chicago campus where I can walk and practice a little each day. New skates will be here TOMORROW .... they will have to stay in the box for a week. Look what arrived today. This is one of two dresses I have bought in anticipation of testing freestyle someday. I am not sure when that will be because my freestyle is in no way, shape or form ready for a freestyle test. I found out today that my skates are definitely on their way. I also found out that our next "test session" will be on March 30, 2012 !!! Yikes !!! I don't think I will be testing freestyle. I think I could probably do my Adult Pre-Bronze Freestyle test, but I don't think I would be able to put a program together. I am still really getting back to basics. In addition ... those new skates are going to take some getting used to. Practice today was short, uninspiring and a bit frustrating. I had such a good lesson and practice afterwards yesterday. Today I was achey and hesitant, even on the Pre-Bronze moves. If my skate was loose, I didn't do them well. When I tightened them up, I could not do my 3 turns or hold my edges. In skating, practice NEVER makes perfect, but practice eventually (usually) leads to improvement over time. Including days of plateau and even of set backs.